Snow Boot and Winter Boot: What’s the Difference? 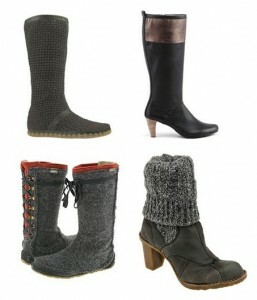 The winter season is slowly creeping in and it’s time to take out your boots once again. For those planning to buy a pair of boots for the first time, it’s best to know kind to buy. You need to choose carefully because it’s very important that you’re comfortable wearing them and they can be worn with almost any of your outfit. Many people think that a snow boot is the same as a winter boot. They are both referred to as boots and have the same goal of protecting your feet from the cold but each has different uses. A snow boot is water-resistant, has a high side extending above the ankle and has a rubber sole. This is meant for use in snow hence should be sturdy enough to protect your feet. You can use this whether in just an inch of snow or even in deeper wet snow or mud. Ideally, this type of snow footwear can be used by people working in snowy situations such as farmers and ranchers. Children who would like to play in snow and muddy lawns can wear this as well. Basically, this can be worn in any wet situation during winter time when you want to keep your feet dry and warm. This is normally made from materials that are easy to clean – purely leather or a mix of leather and nylon. It is well insulated but bulkier, heavier and more expensive. The winter boot is meant for general use and is also waterproof. It is recommended, however, to use a snow gator before wearing this type of footwear because snow can get in notably between the boot opening and the lower leg. Winter boots can be used for every day activities such as walking to work, commuting, shoveling snow on your sidewalk or shopping. This pair of shoes are what you should get to match your casual or office outfit. Get a pair of dark brown or black boots that can blend with any attire. For women who love to wear short skirts or shorts, you may also purchase the black knee high boots to create a stylish look. The ankle-high type is also great to use for casual wear.